Faith and family: Samoan culture to be well represented at WYD 2019 by the Thetadig family. WORLD Youth Day will begin in Panama this week, uniting millions of Catholics from around the globe. The festival has become a favourite for Australian pilgrims after it was launched in 1984 by Pope John Paul II. This year more than 40 Catholics from Brisbane will make the pilgrimage to Panama, including 15 from the Samoan Catholic Youth International (SCYI). “The group we are representing was inspired by my brother Joachim and myself who yearned to represent our Samoan culture as Samoans at World Youth Day,” SCYI organiser Joans Launiuvao said. Mrs Launiuvao said the pilgrimage was a powerful opportunity to lean into the Holy Spirit and see a different world. 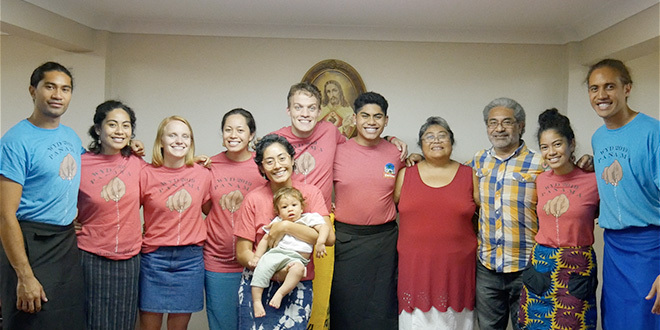 “We live simply, immerse ourselves spiritually in prayer, reflection, share in the faith journey of others and take time away from the mundane of life in Brisbane, representing our Samoan culture – which in itself has a unique and rich faith life – to partake in a week abundant with graces and witness life-changing transformations. Panama will be Mrs Launiuvao’s third World Youth Day. Mrs Launiuvao said World Youth Day was a significant opportunity to be drawn into the divine mercy of God in our brothers and sisters in Christ. Fellow pilgrims, from the Brisbane Neocatechumenal Way community, have also travelled to Panama for the event. Group member Eddie Bubb, who is a four-time WYD veteran, said it was a great opportunity to witness God’s love. “Everywhere we stop for a meal or break we also go into the streets and have a witnessing session,” Mr Bubb said. “We sing a few songs – a lot of the Bible verses are put to music. “There’s also a lot of street missioning. “If we go into a shopping mall and sing a few songs there are always people who want to come up and have a chat and we give our witness and tell people that God is real, and doing the simple things can lead to life. “The Pope is a real person and his message is always simple: back to basics.